Jetski & Parasail Package -One our our most popular packages - 30 minutes on a jetski circuit twin share & a tandem parasail experience enjoying our beautiful Broadwater. Price is based on 2 people sharing. Jetski Flyboard Package - enjoy a 30 minute tandem jetski ride on our 1 kilometre jetski course and 5 minutes per person on our exciting flyboard activity flying high and testing your balance skills. Price is based on 2 people sharing. Flyboard & Parasail Package - Share an amazing 8 minute parasail flight together over the beautiful Broadwater plus you each get 5 minute flight time on the unique Flyboard. Price is based on 2 people sharing. Jetski, Parasail, Jetboat Package - An exciting activity package to share with 30 minutes on our jetski circuit, 8 minute parasail flight and a 45 minute thrilling jetboat ride. Priced for 2 people sharing. Jetboat, Parasail, Flyboard package - An awesome activity package to share with 5 minutes each flyboarding, 8 minute tandem parasail flight and a 45 minute thrilling jetboat ride. Priced for 2 people sharing. 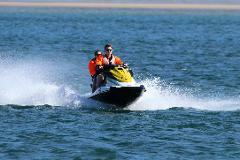 Jetski, Parasail, Flyboard Package - Awesome activity package to share for 2 people. 30 minute jetski circuit, 8 minute tandem parasail flight and 5 minutes airtime each on fantastic flyboard experience. 1.5hr Jetski Tour plus Tandem Parasail - enjoy an adrenaline pumping jetski tour plus an awesome parasail flight.